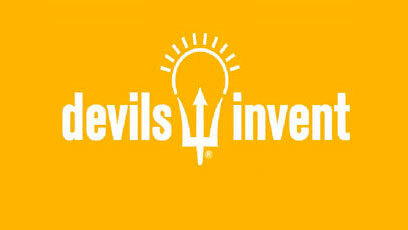 Devils Invent — a series of weekend-long engineering and design challenges — helps the Fulton Schools emphasize innovation and development of the entrepreneurial mindset for our students. Participating students are encouraged to design, build, and implement innovative solutions to challenging problem statements submitted by community, industry and university partners as part of this series hosted by the office of Academic and Student Affairs. 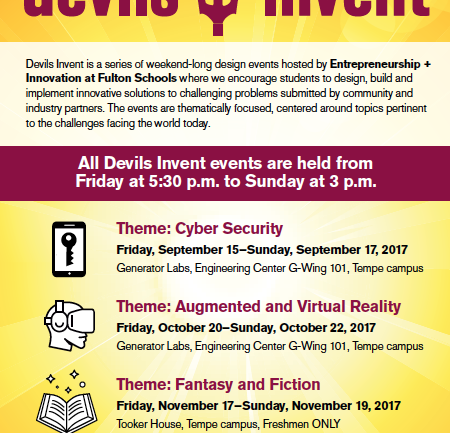 Devils Invent is formatted to inspire and engage students, charging them to produce innovative products, designs and solutions. At the end of the challenge, student teams are assessed based on how inventive, progressive and scalable their solutions are. The challenges are open to all students. 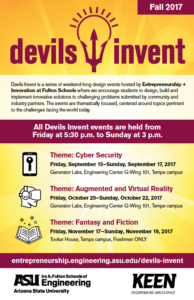 Download the Devils Invent fall 2017 flier. The objective is to provide students opportunities to acquire the skills needed to become successful, innovative leaders. Students embrace their entrepreneurial mindset, compete for the best design and gain practice with rapid prototyping tools. Faculty can help push Devils Invent push the boundaries of the projects our students can deliver in exchange for free meals all weekend and Fulton Schools swag. Our students will exceed your expectations in what they are able to create. You are invited to take part in our events and collaborate to inspire innovation and an entrepreneurial mindset. If you’d like to attend an event to better understand how the design challenge works before making a more formal commitment, please join us! Questions? Please contact Brittany Martin at Britt.Martin@asu.edu for more information.